Home > Hearing > Hearing Loss > What is an Audiologist? An audiologist is a healthcare professional who specializes in the diagnosis, evaluation and treatment of hearing and balance disorders. Most have earned an Au.D. 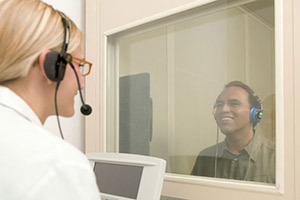 (Doctor of Audiology) degree while others have received a master’s degree or Ph.D. from an accredited university. Audiologists receive extensive training in the prevention, identification, assessment and non-medical treatment of hearing and balance disorders in patients of all ages. They work in diverse settings such as: hospitals, schools, clinics, universities, private practices, VA facilities, hearing aid dispensaries and otolaryngology (ENT) offices. If you are experiencing hearing loss or a balance disorder, an audiologist is the most qualified individual to test, diagnose and treat your condition. No other professional possesses the education, skills and training of an audiologist, and few provide the level of follow-up care necessary to ensure the ongoing success of patients with hearing loss and/or balance disorders.